President Jonathan, yesterday, directed that three job slots each be reserved for families of those who lost their lives during the Nigeria Immigration recruitment exercise. This is even as the Board of the Immigration Service, National Security and Civil Defence, Prisons and Fire Service Board, yesterday, indicted the Minister of Interior, Comrade Abba Moro, over the incident, saying the Board was sidelined. Also, the National Human Rights Commission, NHRC, disclosed yesterday that it had commenced investigation into the tragedy even as the Non-Academic Staff Union of Educational and Associated Institutions, NASU, joined others in calling for the sack of the minister and the Comptroller-General of Immigration, Mr David Parradang. President Jonathan has directed the immediate cancellation of the recruitment exercise. Instead, a special committee headed by the Chairman of the Civil Service Commission, Mrs Joan Ayo, will conduct the employment test to fill existing vacancies in the Nigeria Immigration Service. The presidential directive was given at yesterday's Federal Executive Council meeting where the President further directed that those who lost their loved ones would have automatic slots for three applicants, one of whom must be a woman. He also warned that henceforth, ministers and heads of government agencies where any death is recorded in the course of recruitment exercise would be tried for culpable homicide. Minister of Information, Mr Labaran Maku, who addressed State House correspondents after yesterday's FEC meeting said the President further directed that only the armed forces and the police are allowed mass recruitment exercises. According to Maku, President Jonathan promised to personally pay condolence visits to the families of those who lost their loved ones while those who sustained injuries during the botched exercise were also to be given automatic employment. Maku stated: "The President also took certain measures which he announced to Federal Executive Council. 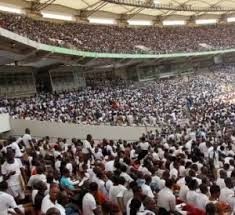 The first is that the Immigration recruitment exercise has been completely cancelled and he has directed that a new exercise will be conducted by a special committee under the chairmanship of the Chairman, Civil Service Commission to conduct the recruitment exercise to fill the vacancies of the Nigerian Immigration Service.